There are scores of seers from Madhwa mathas who have consecrated Brindavana of Raghavendra Swamy in different places across India. 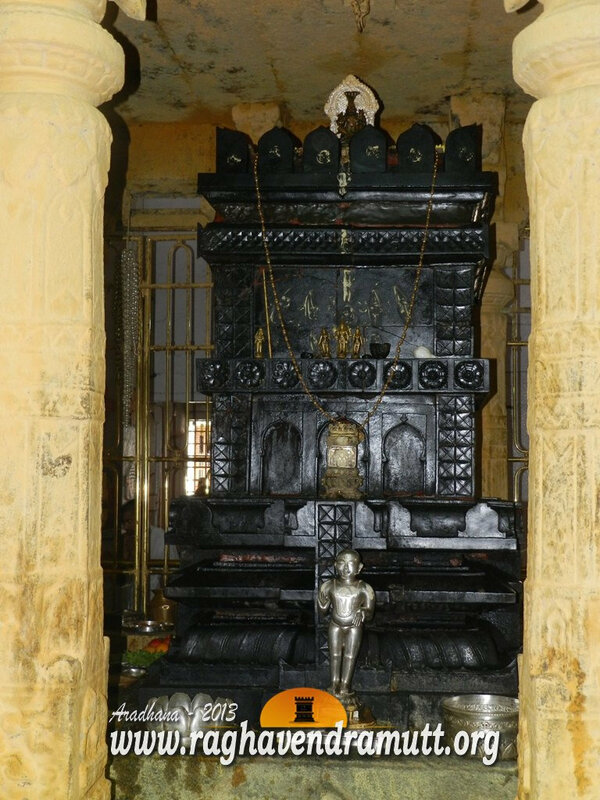 Many of such temples have gained wide popularity and have become places of pilgrimage such as the Raghavendra Temple at Honnali near Shimoga, the Matha at Athani near Bijapur and of course the Dakshina Mantralaya of Tamil Nadu. Infact, in recent years, there has been an increase in the number of temples containing the Brindavana of Raghavendra Swamy that have come up. One of the earliest of such temples to come up outside Mantralaya is the Raghavendra Swamy Matha in Budhikote in Kolar district. The Matha is near Mulabagal and Budhikote is also the place where Hyder Ali, the father of Tipu Sultan, and the ruler of Mysore, was born. The Matha at Budhikote came up sometime in 1681, that is just ten years after Raghavendra Swamy entered Brinavana in Mantralaya in August 1671. Another Brindavana of Raghavendra Swamy near Mantralaya itself is the one at Anu Mantralaya near the Tungabhadra or Mantralaya Road Railway Station. This station is the nearest railhead to Mantralaya and it stands on the banks of the Tungabhadra. . If you travel by train from any part of India to Mantralaya in Andhra Pradesh, you have to alight at the Mantralaya Road Railway station m which is 16 kilometres away from the holy town of Mantralaya. When we alight at this Railway station, we find a matha of Raghavendra swamy and this is Anu Mantralaya or “small” Mantralaya. Anu in Kannada means small and this Matha is the smaller version of the Raghavendra Swamy Matha at Mantralaya. However, very few people know that this matha at the railway station owes much of its existence to Raghukantha Theertha, a pontiff of the Kudali Arya Akshobya Theertha Matha. Raghukantha Theertha was the pontiff of the Akshobya Theertha Matha from 1911 till 1923. In his poorvashrama, he was a disciple of Satya Prakarama Theertha of Uttaradi Math. Raghukantha Theertha was a master of Vedanta (philosophy), karma mimamsa, Grammer and logic. He built a big hall near Tungabhadra railway station (which today is known as Mantralaya Road Railway station) for the benefit of visiting pilgrims. He also established a Mrithika Brindavana of Raghavendra Swamy near the Railway Station. He also ran a free boarding facility near the railway station for the convenience of devotees visiting Mantralaya. This continued for several years. Today, it is this Raghavendra Swamy Matha that he established, that is known as Anu Mantralaya. Apart from Anu Mantralaya, this pontiff also consecrated the idol of Satyanarayana and the Brindavana of Raghavendra Swamy in Satyanarayana Pet in Bellary. This was sometime in 1909. The temple celebrated its centenary in 2009. He was also instrumental in designing the underground Rayaru matha at Jorapurpeth in Bijapur. Devotees should visit this temple as Raghukantha Theertha has built it keeping in mind the instructions of Madhwacharya. He also built a Mrithika Brindavana of Raghavendra Swamy at Gangavathi which can be seen even today. Raghukantha Theertha spent several years meditating at Malkhed. During that time, he constructed a building which is now the kitchen and the dining hall. He also built a road from Malkhed village to the matha. He nominated Tankashali Srinivasacharya as his successor and named him as Raghudaantha Theertha. He entered Brindavana in Malkhed in 1923.